Question: Can a department legally use mug shots or a "Mug Book" for identification purposes? WELLINGTON, NEW ZEALAND — The police have bought software that will let them automatically match faces caught on CCTV cameras against photographs of convicted criminals. Applications manager Ian Smith says the "normal rules surrounding gathering of evidence of a crime" will decide when the technology will be used. 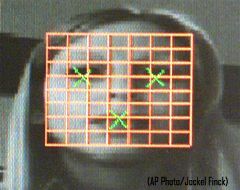 The face-matching software will only work if cameras capture images that are of sufficient quality and from the right angle to match against photographs in its database, he says.